Ten days is too long to be away from my own bed. Lets see where have I been? Over 2000 miles in the car, yes you read that right. We made a huge loop from the midwest through the mountains of West Virginia to the coast of both North and South Carolina, a fly by in south Georgia to drive up through the deep south back home. My bed felt like heaven on earth last night. We saw a lot, rode a lot, walked a lot, ate wayyy too much, and of course I stitched a lot in the car. Four of those days my husband worked all day. If I had a driver everywhere I went, oh the stitching I would get done. The above picture was taken in the car as we drove through the mountains of Virginia. It was a test between three different flowers. I thought the flower on the right, the color was too bright, the flower on the left was way to pale so I settled on the color of the flower in the center. I used one strand of each of the other flowers to get the center one. It reminds me of Baskin- Robbins Strawberry Cheesecake ice cream. I didn't just stitch in the car, I did lift my head and look out as well. And we stopped. I was a really bad photographer this trip. 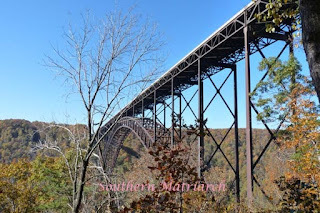 We stopped at the New River Gorge and then drove to the bottom of the gorge. My husband nearly croaked when he looked back and saw how high the bridge was that we had driven over. He is not a friend of heights. But what a wonderful taste of autumn this was. We drove through the mountains of West Virginia. Even stopped for a quaint train festival in Hinton, WV. Then it is back in the car and to North Carolina we head. No pictures taken there. I stitched in the hotel while he worked. Down the coast we go, we stopped at Lee's Inlet Kitchen in Murrel's Inlet, SC for dinner. OMG, the hush puppies. 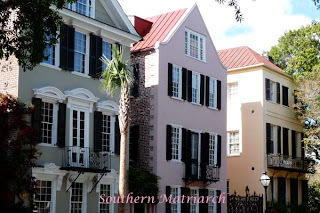 We then get to Charleston and do the whirlwind tour of Charleston in two days. Take it from me, two days is not enough. 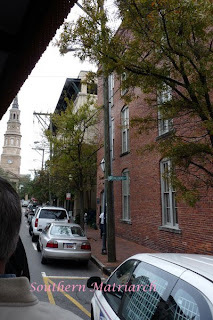 We started our whirlwind on a carriage tour, then we walked through some of the cemeteries, and up and down King Street and the old City Market. I bought a sweetgrass basket for a souvenir. For dinner we went to Hank's for dinner. FABULOUS! I highly recommend their shrimp and grits. Day two we saved our feet a tiny bit by taking a pedi-cab down to the Battery and then walking back up to our hotel. 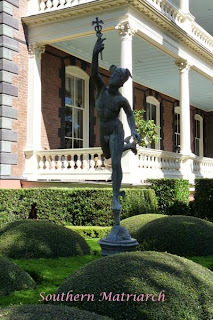 We toured the Calhoun Mansion and the Nathaniel Russell house. 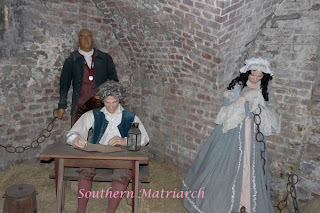 The day was winding down but we did squeeze in the Old Exchange and the Provost's Dungeon, then walked the waterfront before we crawled back to rest before dinner at the historic restaurant, McCrady's. Wowzer, talk about fabulous!! I have raved about the heirloom tomatoes and house made buratta ever since and the corn bread pudding. Wonderful. Kudos, there was no "George Washington Ate Here" sign even though it is a part of their storied history. The hostess was wonderful enough to hail another pedi cab for us because my feet were revolting by this point and were not going to make the mile walk back to the hotel by the end of the second long day. Next morning we attended Mass at St. Mary's, the oldest Catholic Church in the Carolinas and Georgia. Beautiful. 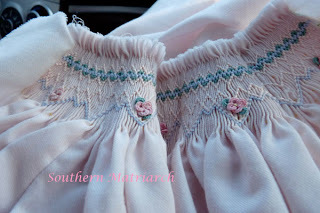 It made my heart sing to see all of those babies and children in smocking and heirloom sewing. 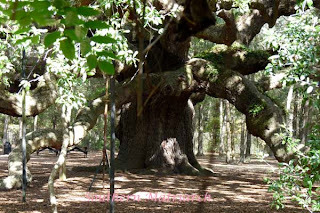 On our way out of Charleston we stopped on John's Island to see the Angel Oak Tree. Magnificent and humbling. And back in the car. 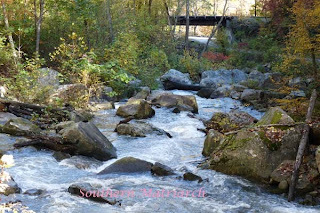 We traveled to south Georgia to see our oldest daughter. Too quick of a visit. Dinner was great, company even better. And yesterday we are in the car once again to trek home through 6 states to get home. Of course being in the car I could work on my French Handsewn dress previewed here, here and here. 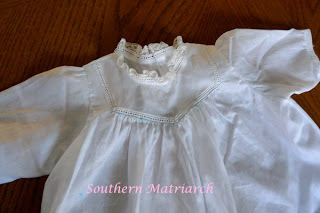 I think I am going to dub this dress the "Car Dress" since so much of it has been stitched in the car. 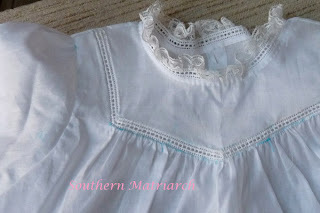 It is almost finished.I have to gather and attach the ruffle and sleeve lace, then do the embroidery. Then my first convention class project will be done. I hope you enjoyed this little impromtu tour of the southeastern US. Hopefully I will be back with more stitching to share soon. Till then faithful reader. 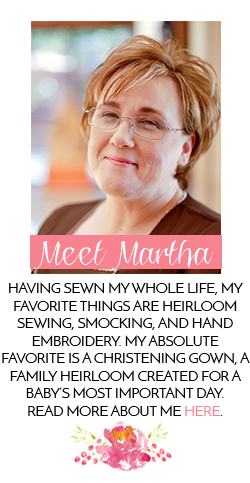 You make a wonderful travel guide, Martha. Thanks for the lovely tour. I am sick that you have almost finished that dress. :) I did enjoy your trip, but I missed YOU! Robin, get on that dress woman!!!! I missed yer face too. Oh Martha, it sounds like you had a lovely trip. Your pictures are great and I know they are just a very few of what you must have taken. Glad you are home but glad you got to take such a fun trip. 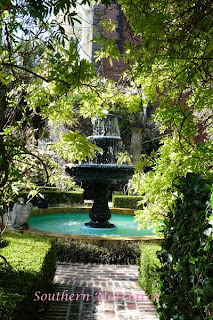 I love Charleston, you did it justice with all the beautiful pics. I miss you, glad you had a fabulous time with JD. I chuckled at the comment about him and heights. One last thing, what smocking plate from ASE is the bishop? It is beautiful, but then I expect nothing less from you. I do love my own bed, but I probably would have stayed in Charleston! I forgot about Hank's. Now I am craving authentic shrimp and grits! Thanks Goosegirl, truth be told, this was about the total pictures I took. I just didn't take very many this time. Not sure why. 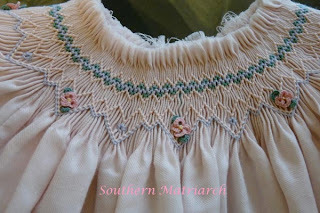 Lori, thank you darling, It is a combo of smocking plates. 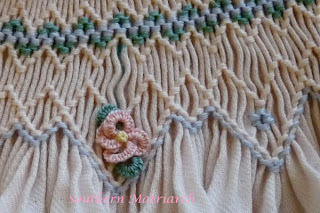 The colors are from the kit for Gabrielle issue 68, but the smocking design is a portion of Water Lilly from issue 32. And then I added Gail's 4 petaled cast on flowers from her book. Jan, you would LOVE Hank's. I could have spent several more days there. I may even see if Laura has spaces in her school if a new contract comes along soon.